As President Barack Obama leaves the White House after eight years in office his legacy includes policies that hindered job opportunities for young people and saddled them with debt, according to newly released statistics. 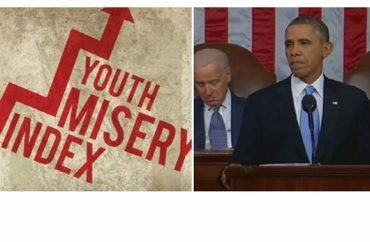 Young America’s Foundation on Tuesday released its annual Youth Misery Index and found it at a record high. The index is calculated by adding youth unemployment, student loan debt, and national debt (per capita) numbers, and the 2017 figure of 113.4 is up from 109.9 last January and 83.5 in 2009, when President Obama took office, the foundation notes. “Over the course of Obama’s presidency, the YMI has spiked an alarming 29.9 points, an increase of 36 percent,” the group stated in a news release announcing the latest figures. Federal student loans, while increasing, generally hovered at around $100 billion from 1995 to 2010, but spending since then increased tenfold to a whopping $1 trillion, according to federal reserve bank stats. The student loan debt spike also took place largely under Obama’s watch, and the White House has actually argued that student debt is ultimately good for the economy.